Yellow fever is preventable by immunization. Travelers to countries with yellow fever should get the yellow fever vaccine. 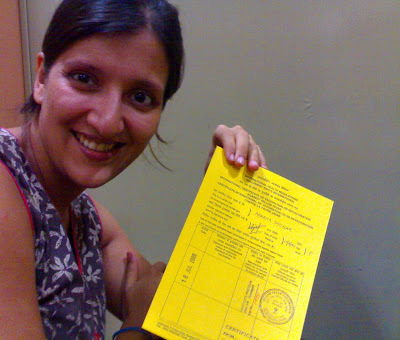 Some countries issue a Visa only if you have a Yellow Fever vaccination certificate, issued by the authorised vaccination centre. I have consciously highlighted some of the words above. That summarises the reason why I had to get the Yellow fever vaccination. Getting an injection was hardly the issue. The process to get the same was the most painful thing I had to endure in my life. Like any hopeful traveler, I headed to one of the two centres in Mumbai, which gives this vaccination – Seaman’s Clinic in Ballard Estate. As I approached Navbhavan building, there was a long queue and things definitely did not look right. We were about to enter the building, when we noticed an A 4 size printout pasted on the dirty yellow door. It read Yellow Fever – 80 injections Only – 2 pm to 4 pm. Well, 80 is a decent number.. so we thought. We went in and found more A4 sheets pasted on other doors, which read – No enquiry on yellow fever to be done here. We discounted the same thinking that people did not want to be disturbed with unnecessary questions. On reaching the inner room, we were approached by a peon, who dismissed us away in 2 minutes telling us that we should turn up at 10 am the next morning and stand in the queue. Bizarre but true. But, we did not understand the procedure. On stepping out of the building and meeting 3 guys (who seemed more than happy to talk to 2 girls considering the shortage of women in that queue) explained to us that there are no systems in place for the Yellow fever vaccination. 80 injections are given officially, but unofficially it can go upto 120 or 130 or any number. It depends on the peon and the doctor. However, the catch was that the people queueing up were more than 150 everyday. Since there is no register to actually take down the names, the person who lands up first starts a list. This list is a sheet of paper containing the names and passport numbers of whoever turns up to take the vaccination. This list is made from the previous night onwards. People turn up all night and add their names to the list. 80 names get filled up typically by 5 or 6 am. We thought he was kidding. Who on earth would wait from 9 pm till next day 4 pm to get an injection. I reached the clinic next morning at 7 am and saw a huge crowd. Guess what number I got on the list – 125, 126 and 127 for my friend Neesha, my husband Roy and myself. Attrocious. I was in a predicament. I really did not know whether it was worth waiting or whether I should come back another day. I decided to try my luck and wait all day. I did forget to mention that the reason why I came to Ballard in the first place was because Sahar International Airport, the other centre had run out of vaccines. A guy picked up my call and said – ” Vaaacine khatm ho gaya… Thhhheeeen chhhhhar din ke baaaad try karnaaaa”. It is indeed common that the centres run out of vaccines and people are left stranded outside these centres hopefully for the day they can get injected. No 82 – A 24 year old guy who works in a cargo ship and has traveled to half the world told me the names of clubs I need to visit in Copacabana beach in Rio. Imagine.. he already had a yellow fever vaccination done earlier but laminated his certificate. Laminated certificates are not accepted in some countries and he was forced to get this done all over again. No 138 – A tantrum throwing doctor, who felt that by claiming she was a doctor, could manage the injection faster than we did. She was wrong. No 30 and friends – A black T shirt clad shippie (with a ear stud et all) who had taken control of the list and stood guard at the dirty yellow door with his wingmen – a blue t shirt clad optimist and a white shirt clad pessimist. The optimist always smiled at us and mentioned that they may give 120 + injections. The pessimist was not even hopeful of getting his injection. No 102 and his dad – A 21 year old who had to go and work in Africa (Nigeria), who had been visiting the centre for days, but in vain. No (between 1 – 80) Bald Rich guy and family – Bald rich guy and family came 5 minutes before their injection, walked in royally, got their injection and left. They had the money to get some other guys to stand in the queue on their behalf. My friend Neesha landed up around noon with some Candies sandwiches. Roy decided to leave for work as he was already 3 hours late. We entertained ourselves by discussion our travel plan a bit more. It was around 1.30 pm and they called the first 80 people in. Around 3 pm, people started coming out with Yellow cetificates in their hand. The peon came out around 4 pm and called another 20 people in – No. 80 to 100. It looked like there was no hope for those beyond 100. Not today. Not another day. A brainwave struck me. I made Roy rush to Riya travels and get dummy E tickets issued for us for the next day. Someone had told us that if we had to travel on emergency and could produce tickets, they have to give us the injection. 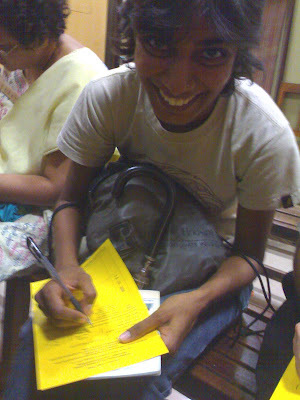 After waiting the entire day, I was willing to go to any extent to get that damn injection. With tickets in our hand, we patiently waited for the peon to show his face. Patience turned into frustration for many who were in the queue. The commotion started to build up and everyone gathered around the clinic door. The peon came out and called for 5 people with tickets. I think the three of us were lucky to get in… being among the only 3 women in the entire queue, he called us in. We were made to sit in this windowless room with benches. The peon and his sidekick (another peon I think) came in and discussed matters of money. The vaccination cost only 150 Rs. But, in a typical Indian way of asking for a bribe, the peon said – “Aap khushi se kitna denge”. I felt like telling him – “Pehle mein khush nahin hoon. Doosri baat…. mein aapko ek thapad dena chahti hoon”. Roy took over the situation. Exactly at that time, the impatient lady in the queue behind us thrust a 500 Rs note on the peon’s face and raised the stake. You can imagine how frustrating and infuriating it is. The rest is history…. you can fully imagine what happened. 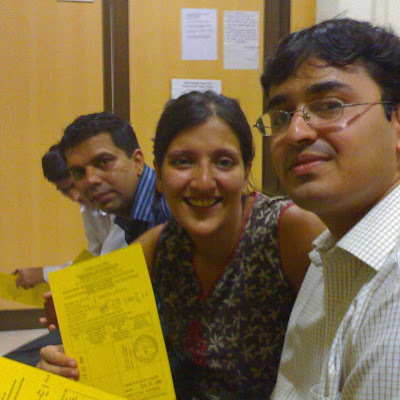 We had to then fill the form, get the injection and the certificate. It all happened in 10 minutes. The doctor sure did not look like one I would go to under normal circumstances. He introduced himself as an ex-army commando, who is interested in martial arts and hence, would like to see my Capoeira class, when I told him about my martial art. He then wanted my telephone number. So, I just gave him a wrong number, got the injection, smiled politely and walked out with my Yellow certificate. it is to get it, I plan to do full “Paisa Vasool” – visit every country which has yellow fever in the next 10 years. Africa – Angola, Benin, Burkina Faso, Burundi, Cameroon, Central African Republic, Chad, Congo, Democratic Republic of Congo (Zaire), Equatorial Guinea, Ethiopia, Gabon, Gambia, Ghana, Guinea, Guinea Bissau, Ivory Coast (Cote D’Ivoire), Kenya, Liberia, Mali, Niger, Nigeria, Rwanda, Sao Tome and Principe, Senegal, Sierra Leone, Somalia, Sudan (South of 15 ° N), Togo, Uganda, Tanzania, Zambia. You should have tried getting it at the airport since the queue there is much shorter. Cheers,Aadil. LOL this is funny – I just saw your photo and name and realized who you are – we already connected on CouchSurfing and you were the one to recommend Akbar Travels to me 🙂 Small world!Another funny thing is I return around the same date you leave, so I’ll have much gyaan to offload to you guys. Cheers… to South America! landed here from a link a friend sent me, reminding me to get this vaccine – i’m supposed to fly to Brazil on Tuesday morning!wow, i thought this was a piece of cake but now you’ve got me scared. thankfully i have my tickets et al, so shall rush to this Godforsaken place tomorrow morning first thing. i’m thinking a press ID would help too ;)bon voyage to you guys – where u off to? hmmmm, I think yellow looks great on you…lol. After all this adventure and standing in line, now you actually get to travel! Haa haa haa…Apu, man I was laughing as I was reading your blog…while I know it must have been anything but funny for you, your vivid description of the place & its characters was awesome! Me think I’ll try and get it done from a private nursing home.Some how!! Just reading about standing in the queue!! Makes me soooo flusterated.